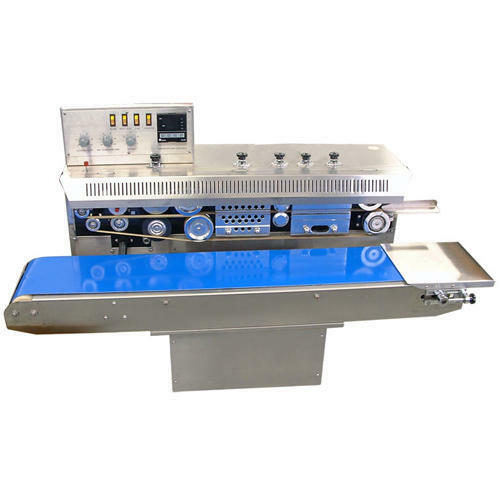 Continuous Band Sealer are ideal for sealing Virgin and laminated pouches. Presentable Digital temperature controller is used to monitor the temperature for different types of pouch material. Sealing is achieved by heat conducted through Teflon coated gripper belts for continuous Band sealers. The hot Gripper belts carry the pouch and cause localize melting of pouch material. and subsequent sealing by metallic and rubber pressure roller. The pouch carrying conveyor and gripper belts are driven by common drive resulting in synchronous movements of pouches. Founded in the year 2013, in 2013, in Faridabad (Haryana, India), we “Precision Pack Tech” are listed as the most renowned Manufacturer, Exporter and Supplier of a comprehensive assortment of Filling Machine, Form Fill Seal Machine, Band Sealer, Weigher Machine, Packing Machine and more. The offered products are manufactured using the high quality raw material and advanced technology in complete compliance with defined industry standards. These machines are highly demeaned in the market for their features like durability, low maintenance, easy to operate, high performance and sturdy construction. The offered products are inspected on several quality parameters using modern testing tools and devices by our quality experts for ensuring their durability and quality. Our offered products are provided in a high quality packaging material in order to ensure secure shipment at users' end.